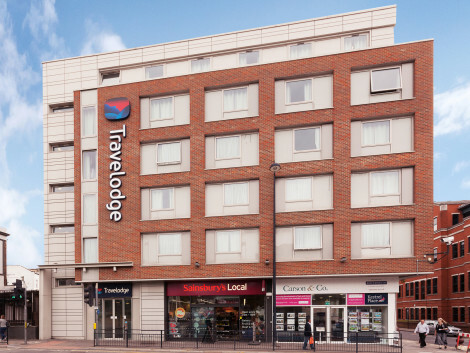 Work and play at the well-connected Holiday Inn Maidenhead/Windsor hotel, close to local business parks and Legoland. 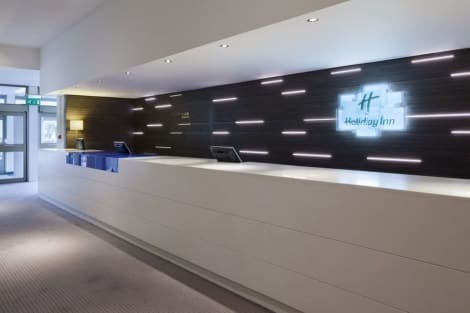 Check-in with our friendly staff at the relaxing and bright Lobby of the Holiday Inn Maidenhead/Windsor. The hotel is set in a peaceful residential area, 2 minutes from the M4 motorway and 17 miles from London Heathrow Airport . We're 1 mile from Maidenhead and 8 miles from Royal Windsor . Leave your car in our complimentary car park and cross the road for meetings at Vanwall Business Park . Firms based at Maidenhead Business Park are 2 miles away from the Holiday Inn Maidenhead/Windsor. Light streams into our 400-capacity Ballroom, one of 10 modern meeting rooms . Children under-12 stay and eat free when sharing a room with their parents at the Holiday Inn Maidenhead/Windsor. Legoland theme park is 8 miles away, and you can stay here after weddings in Berkshire and race days at Ascot , 15 miles away. Quench your thirst with your favorite drink at the bar/lounge. Full breakfasts are available daily from 8 AM to 9:30 AM for a fee. Make yourself at home in one of the 13 guestrooms featuring espresso makers and flat-screen televisions. Complimentary wireless Internet access is available to keep you connected. Conveniences include complimentary bottled water, housekeeping is provided daily, and irons/ironing boards can be requested. Make yourself comfortable in this apartment, featuring a kitchen with a refrigerator and an oven. A 30-inch flat-screen television with satellite programming provides entertainment, while complimentary wireless Internet access keeps you connected. Conveniences include a separate sitting area and a microwave, and housekeeping is provided on weekdays only. A handsome riverside town in the fertile valley of the Thames, Maidenhead has probably been inhabited since at least the Saxon period. Although it could easily be considered a quintessential London commuter town, this settlement has an important historic legacy, because it was, before the railway era, a busy stopping point for people travelling between London and Bath. Learn about the heritage of the town and its transformation from a quiet crossing point and coaching stop to a much larger residential community after the opening of the railways in the Victorian period. The Maidenhead Heritage Centre also examines the town's role in the First World War, and organises monthly lunchtime talks on key events in the town's history. The oldest inhabited castle in the world, Windsor Castle has been an exclusive retreat for royalty for more than a millennium. Unsurprisingly, it's one of Britain's most visited and recognisable attractions, and, despite a serious fire in 1992, is exceptionally well-preserved. Queen Elizabeth II is the 40th monarch to have lived in the castle, and still spends many of her weekends here. This picturesque market town is famous worldwide for its Royal Regatta, which has taken place annually since 1839 and is one of the most prestigious events in the British social calendar. The world's leading regatta is also known for its strict dress code, and includes 20 events, all of which take place over a five-day period in early July. Enjoy some great hospitality at the Holiday Inn Maidenhead or the Fredrick's Hotel Restaurant Spa, or choose the affordable Thames Riviera Hotel, one of the most romantic Maidenhead hotels. Other excellent choices include the Elva Lodge Hotel, the Norfolk House Hotel, and the Walton Cottage Hotel & Suites. Lovers of Indian food should consider the Maidenhead Spice restaurant or the Ghandi Indian Restaurant, while Italian food fans might want to try the Bianco Nero restaurant. For other delicious European dishes, head to Green Parrot Casual Dining, or treat yourself to some tasty English recipes at The Sun and Stars.